Hi everyone, are you in need of something fun to do on 4th of July? If so, Alex here to tell you about the perfect event! 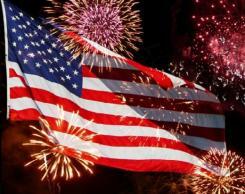 The Temple Terrace 4th of July Parade and Festivities is taking place on Monday, July 4th and will begin at 10am. The day will include a parade, variety of festivities, good food, live entertainment and a beautiful fire work show. The parade route begins at Whiteway Drive and Gillette Avenue, travels south on Gillette to Druid Hills Road, then turns west to Ridgedale Avenue where it will turn south and disband in the parking lot of Temple Terrace Elementary School. The parade length is approximately 2 miles long. The evening festivities begin at 7 p.m. at the first fairway of the Temple Terrace Golf and Country Club (200 Inverness Avenue). There will be a variety of food and beverages including: hot dogs, hamburgers, snow cones, cotton candy, popcorn, lemonade, sodas and water available for you to purchase. The evening will end with a spectacular fireworks display, which will begin at approximately 9:15 p.m.
What better way to spend your 4th of July than with a parade, festivities, entertainment and a beautiful fire work display? For more information contact the Greater Temple Terrace Chamber of Commerce at 813-989-7004 or ltice@templeterracechamber.com. Tell your friends about this annual event. It seems like a blast! Check back often for more information on Things To Do In Tampa Bay!